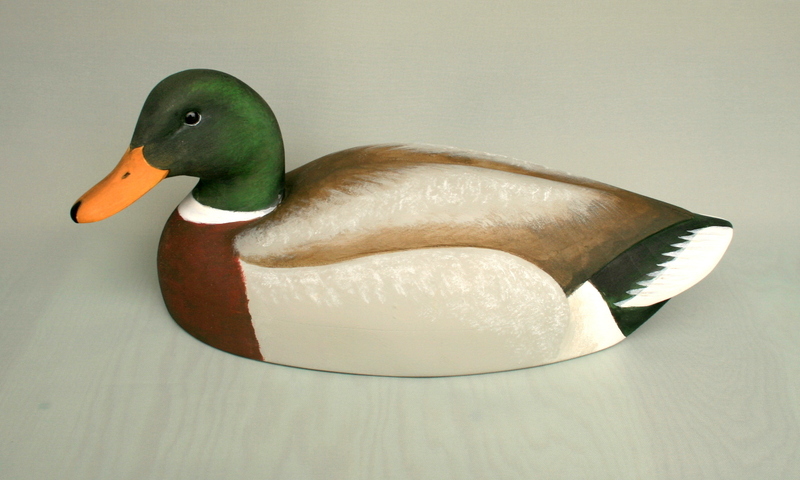 This Drake Mallard is a mantelpiece bird finished in oils. It is the first “drop-wing” I have carved. 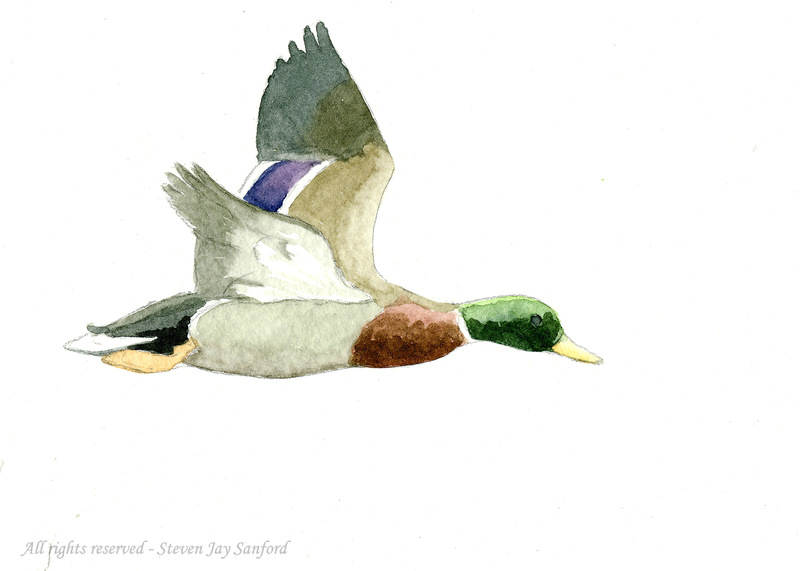 This posture gives a wonderful opportunity to expose more of the wing and thus to paint the full, eye-catching speculum. 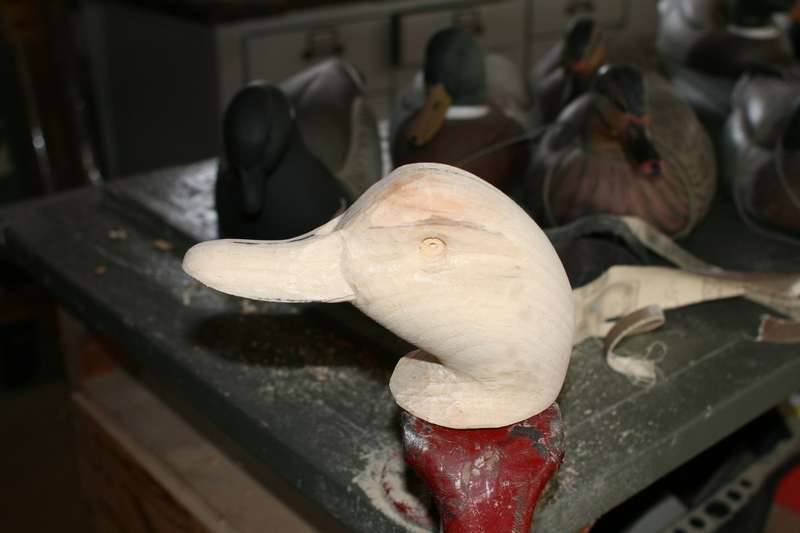 The preening aspect gave me an opportunity both to play with the neck contours – my favorite part to carve – and to figure out the paint pattern in that area – everything gets twisted around when the head is facing the tail. The oils allowed me to incorporate some different techniques. 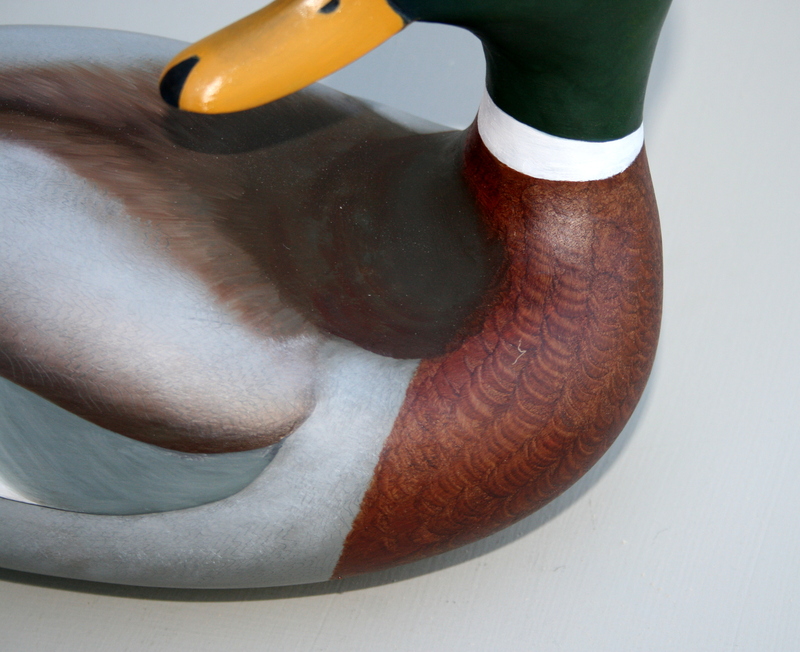 I used a traditional graining comb on the sides and back and used a brush – pushing the paint into small scallops – on the chest. 60. Clamp firmly but don’t go crazy – so glue eases out of joint and seam appears tight all around. 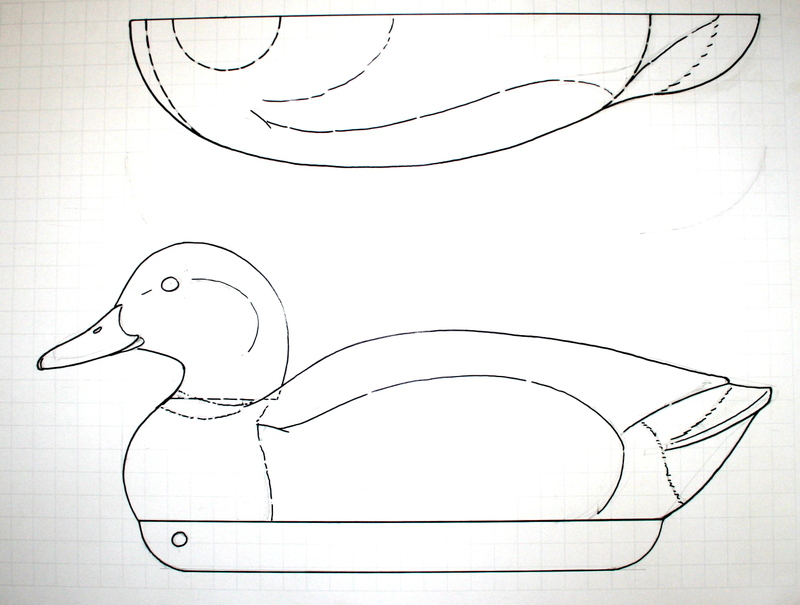 I used this bird, too, to demonstrate my carving methods – both a head carving tutorial and a body carving tutorial. These step-by-step presentations are here in the How I Do It category. 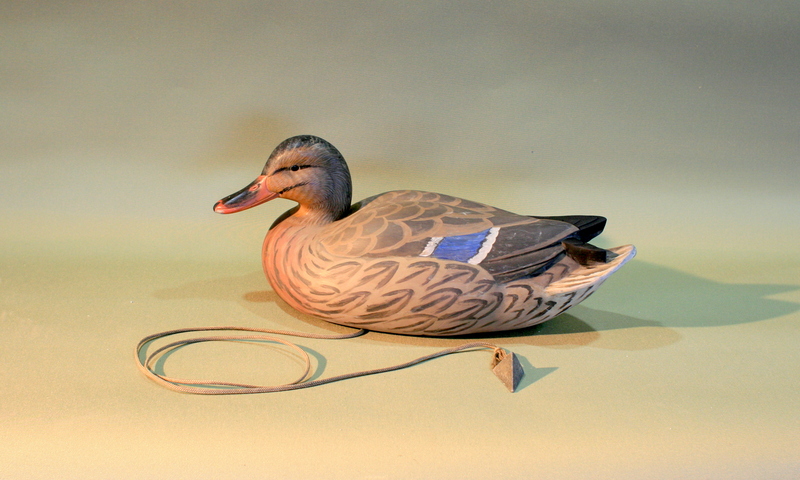 Mallard decoys give ample opportunity for sharing techniques. 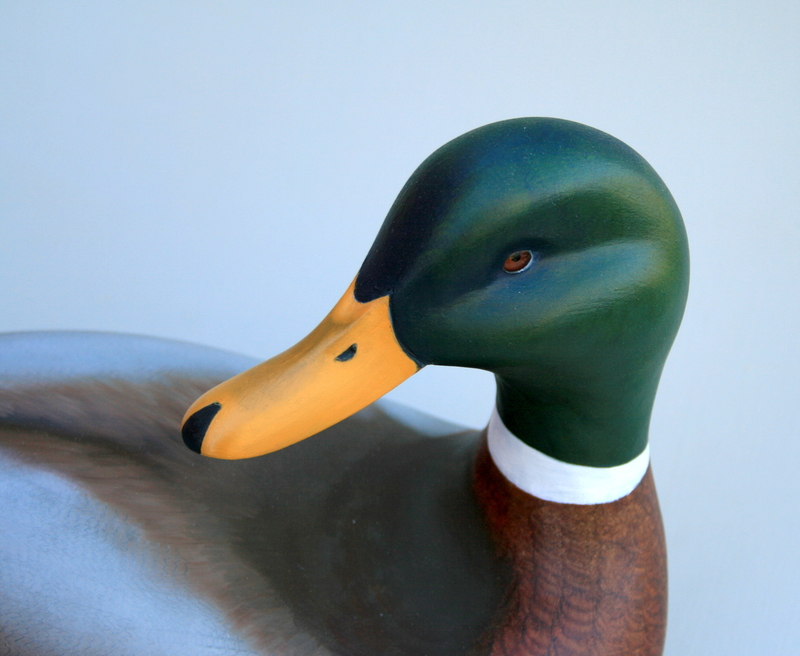 This Drinker head was used in a foamer tutorial for a Black Duck and a Mallard – it, too, is in the How I Do It category. 38. Here’s the Drinker is full paint. 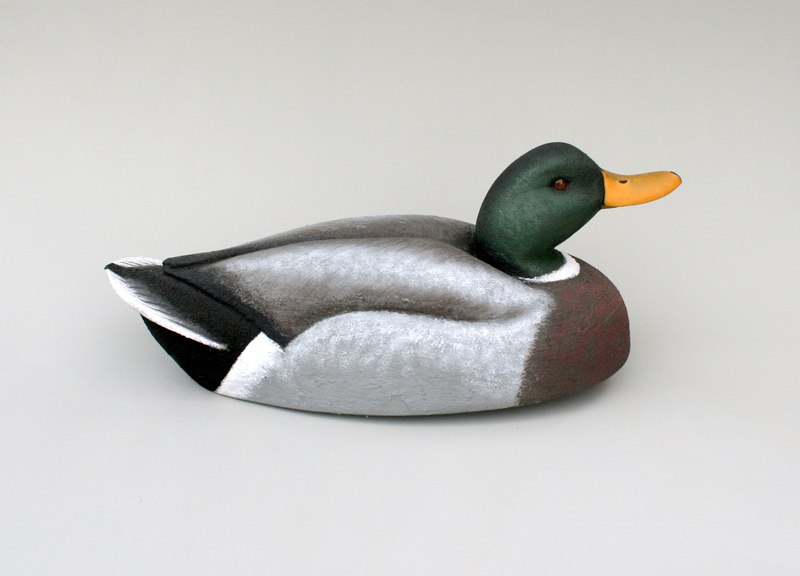 Here is the completed foamer – the body is 9″ wide X 18″ long. I carved this gunner for my own saltwater rig. It is hollow White Pine and life-size. The silvery look on the sides and back – on this bird and the factory plastic gunners below – is done by stippling. I use a dry-ish brush with a little bit of white and hit the bird with the ends of the bristles. 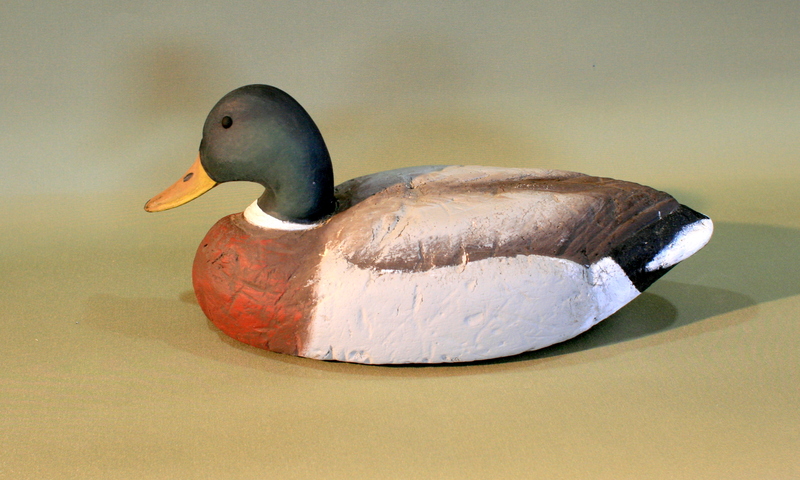 These two decoys are older Herters Model 72s – they have the flat bottoms (no molded keel) and the heads are fastened with the nice brass screw eyes – later replaced with rust-prone steel. I bought these when I was 15 (circa 1968). The $28 price at the time was exactly my take-home pay as a department store stockboy – where I worked 28 hours each week. 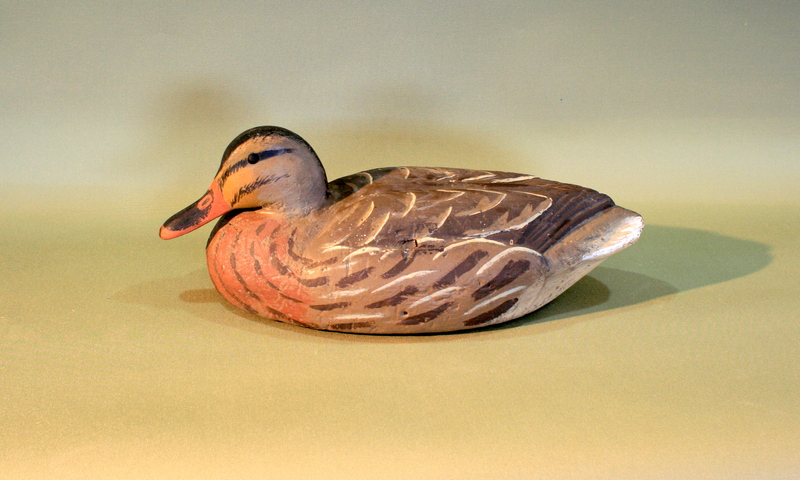 I still hunt them – and added another dozen that I bought at the South Shore Waterfowlers’ Duckboat Show on Long Island. Although I painted them when I first got them from Herters, I re-painted the whole rig about 10 years ago. To mix up the poses I did two things. 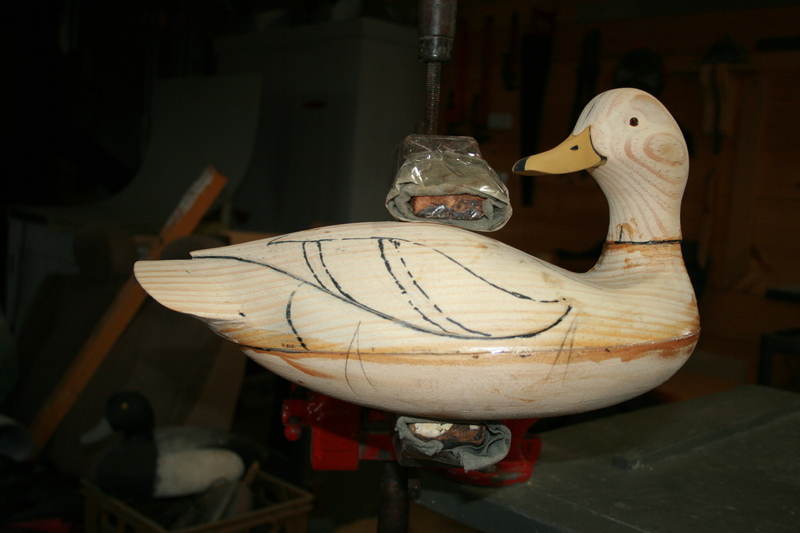 First, I re-fastened then glued the heads – always a good idea with the Model 72s because the soft styrofoam bodies can compress at the screw eye. I mixed up the degree of turn, port and starboard. The other thing I did was break out the Bernzomatic torch. 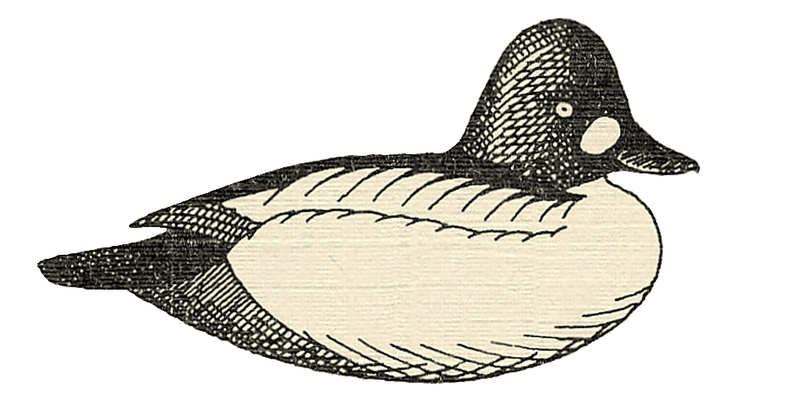 I warmed the necks enough so that I could tip some of the heads down a bit – as with the Drake above – and some of the heads were “smushed” right down to give that lowhead, bullneck pose so typical of cold weather – as with the Hen above. I keep heavy mushroom weights on these birds and use them in our rivers during the late season. I bought these birds for my “upstate” rig. 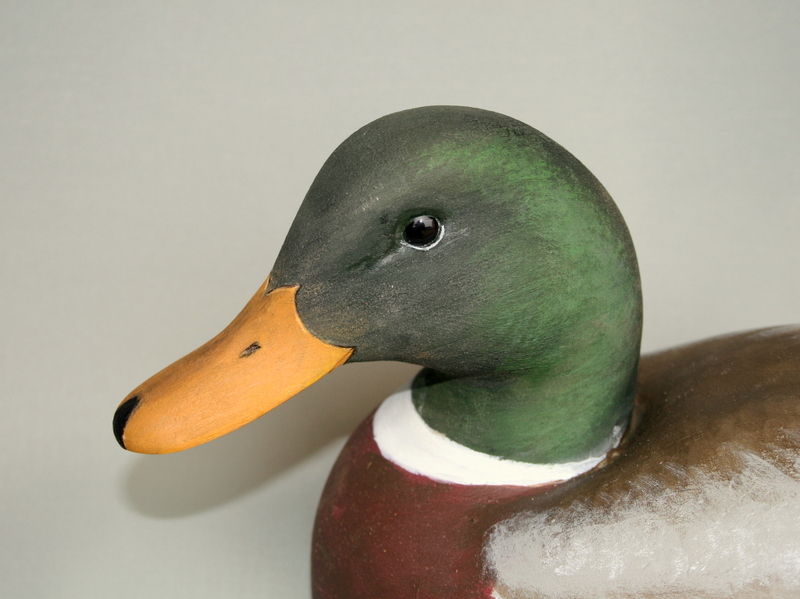 Many of our hunts on smaller waters require a long carry – the decoys and their weights get a bit heavier each year. 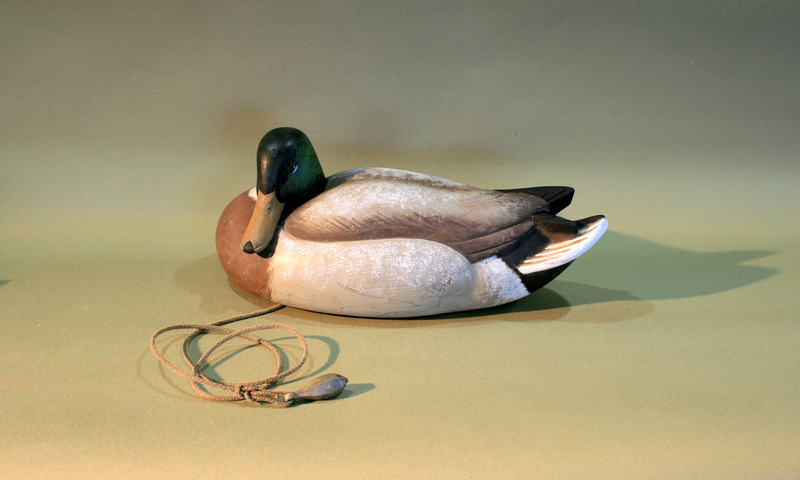 I bought the E Allen birds – I believe the master was carved by Keith Mueller – for a light rig. I mounted the keels flush so they take up little space in the bag or canoe and the weights are 1-ounce sinkers. 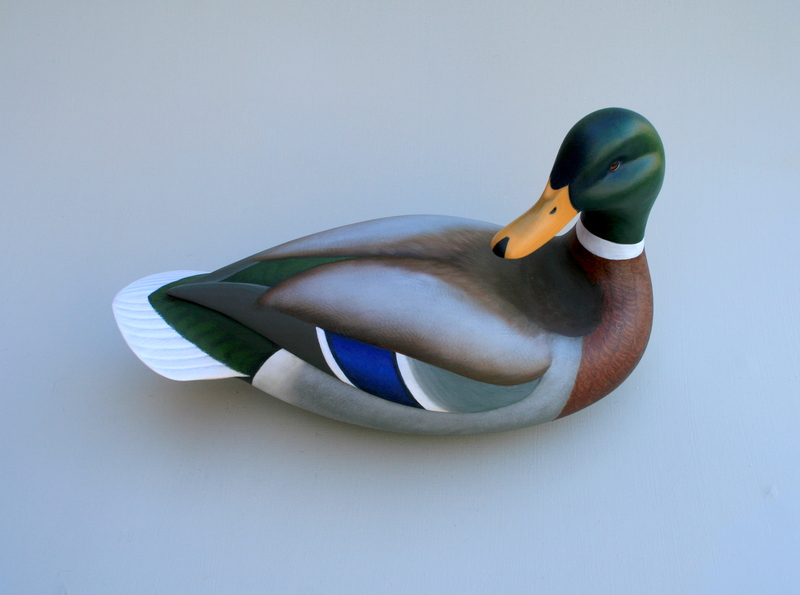 These birds are molded from urethane foam so they are much tougher than the old styrofoam Herters. very nice work! I would like to purchase a kit for my son, as a beginner. Would you have suggestions? I have googled but have not found what I was looking for. I am looking for tools, wood, and pattern. Thank you for your time.